Ai Weiwei is weary from travel. The Chinese artist and human rights activist shuffles into the Marciano Art Foundation’s cavernous Theater Gallery — he arrived in L.A. from Berlin just last night and has spent about half the year, he says, traversing the globe making films or exhibiting art. The Marciano space, a former Masonic temple theater, is dimly lighted and nearly empty, a box of cool, gray concrete. But at the far end of the room, light emanates from a new piece Ai has created – he’s seeing it installed here for the first time. Ai slowly makes his way across the room, soft spoken and a bit spacey, his loose cotton clothing fluttering ever so slightly from the AC — as if crossing a dark ocean toward the light. Finally, he peers over a railing into the glowing, sunken Black Box gallery housing his work. His cheeks lift and his eyes brighten. He’s talking about “Life Cycle,” the central piece in the Marciano exhibition, the artist’s first solo institutional show in L.A. The exhibition, also called “Life Cycle,” is one of three Ai Weiwei shows opening in L.A. this week; the others are at Jeffrey Deitch gallery and UTA Artist Space. The “Life Cycle” work that now has Ai’s attention looks like an enormous inflatable raft crammed with towering human figures bearing animal heads of the Chinese zodiac, all crafted entirely from thin switches of bamboo. It took dozens of craftspeople, using ancient Chinese kite-making techniques, nearly two years to make. The work is similar to his 2017 piece, “Law of the Journey,” which was made from black PVC rubber and which also addresses the global refugee crisis, a central theme in Ai’s work, whether it be installation art, photography, porcelain works, multimedia performance or documentary film. The figures, with their long necks and animal heads, are imposing, frightening even, but they’re also hollow, transparent, like ghosts lost at sea. “Life Cycle” almost didn’t make it to Los Angeles. Ai, an outspoken political dissident, has long been targeted by the Chinese Communist government for channeling his social justice activism into online projects and art that has resonated around the world. In 2011 he was arrested and detained, in a secret location, for 81 days after having been accused of vague economic crimes. Since getting his passport back in 2015, he’s resided in Berlin but has kept an active studio in Beijing, his Zuoyou studio, where “Life Cycle” was assembled under his guidance. Just days after the artwork was shipped to L.A., Ai’s Beijing studio was demolished by the Chinese government. No one was hurt, but some artworks were damaged, others totally destroyed. He’d been alerted, months earlier, that he’d eventually have to vacate the space because it was being redeveloped – but the demolition began, as a surprise to him, before the mutually agreed upon evacuation date and without his consent. We forget humanity is not something we originally always have had but rather, it’s something we need always to defend. Ai was in Berlin when the Aug. 3 destruction began. It was late morning and he’d just taken his son to school when his Beijing studio assistants began sending photos and video clips via WhatsApp. A construction vehicle was shattering the building’s windows, then wrecking its brick and concrete walls. The experience wasn’t new to him. In 2011, his Shanghai studio — which he designed and built from scratch — was also demolished by local authorities. This sort of “demolition of human rights,” as Ai calls it — homes being torn down so government-owned land can be redeveloped — is a common practice in China, he says, one that disproportionately affects migrant workers and poorer communities. “And there is no law that can protect any individual. “Life Cycle” not only conceptually addresses Ai’s exploration of refugees and displacement, but without its original studio to return home to, the work — a vehicle for passengers and a passenger itself — physically embodies those ideas as well. A time-lapse video of Ai Weiwei’s “Life Cycle” as it’s installed over three weeks at the Marciano Art Foundation, including narration by the artist himself. The film is by Jeremy Eichenbaum and the Los Angeles Video Club. “So fragile, like life,” Ai says, stepping down the stairs into the Black Box gallery for an eye-level view of the work. Above him, mythical creatures from the ancient Chinese text, the Shanhaijing, made from bamboo and white silk, dangle from the ceiling – a snake swooping through the air, a four-headed fish with legs outstretched and mouths agape. A third piece, a dense wall installation called “Ten Windows” (2015), is composed of hundreds of two- and three-dimensional objects, also made from bamboo, that dangle on twine and cast pronounced shadows on the walls, like a tangle of stark line drawings. Part intricate mobile and part narrative tapestry, “Ten Windows” is political, art historical and autobiographical at once – and funny. It’s peppered with middle fingers “flipping a bird,” as Ai says, and cartoonish birds — resembling the Twitter logo — nodding to his frequent social media activity. There are references to Marcel Duchamp’s bottle rack, Jasper Johns’ numbers and imagery from Ai’s own works, such as stools, bicycles and Lego bricks. But the piece is also disturbing. There are bamboo re-creations of the six hangers Ai was given in detention to dry his freshly washed clothing. There’s a replica MRI image of his hemorrhaging brain after he was assaulted in 2009 by local police in the city of Chengdu. When an Ai Weiwei exhibition comes to town, it’s less a quiet affair at a single art gallery. Instead, it’s an expansive art intervention, with multiple shows, across multiple artistic mediums, in multiple locations. Last year’s “Good Fences Make Good Neighbors” in New York involved more than 300 public artworks spanning all five boroughs. In L.A. this week, the inaugural show at Jeffrey Deitch gallery, which opens its doors Sept. 29, is “Ai Weiwei: Zodiac,” showing new and historic work. Deitch is displaying the artist’s seminal 2013 “Stools,” involving nearly 6,000 antique wooden stools from Northern China that date back to the Ming and Qing dynasties and the Republican period that followed. The work is both a textural and abstract ode to Chinese social and cultural history. A surrounding survey of works will also include new Zodiac works made from Lego bricks. The art gallery offshoot of United Talent Agency, which represents Ai, will present “Cao / Humanity,” a show of the artist’s marble and porcelain sculptures as well as a new, crowd-sourced, multimedia performance project based on Ai’s book published earlier this year, “Humanity.” The little blue book comprises quotes taken primarily from the more than 300 interviews and public talks Ai did in 2017 after his documentary feature about the refugee crisis, “Human Flow,” was released. For the new video project “Humanity,” guests to the UTA Artist Space – which Ai designed the interior of – are invited to record themselves reading passages from Ai’s book. The video will play in the gallery. Individuals are encouraged to share their recordings on social media, as Ai has done. It’s so dramatic, but it’s nothing compared to the dramatic conditions of people fleeing from their homes to avoid bombing or war. Ai has long wanted a solo exhibition of multiple works in L.A., he says. He views the city as one of imagination and invention and the West Coast, more broadly, as a place for burgeoning technology and creativity, but also a place roiling with immigration conflicts and border issues, central themes in his work. So it’s “the right moment to have art to be celebrated and to have a voice to be heard in L.A.,” he says. The very different works on view in L.A. address a panoply of topics. But Ai sees all three exhibitions as one show, with certain themes rippling throughout, not only refugees but freedom of speech, surveillance, classic Chinese craftsmanship, individualism and mass production among them. Chinese artist Ai Weiwei takes on L.A. with three exhibitions: A solo exhibition at the Marciano Art Foundation; a show at Jeffrey Deitch’s new gallery and sculptures at UTA gallery. 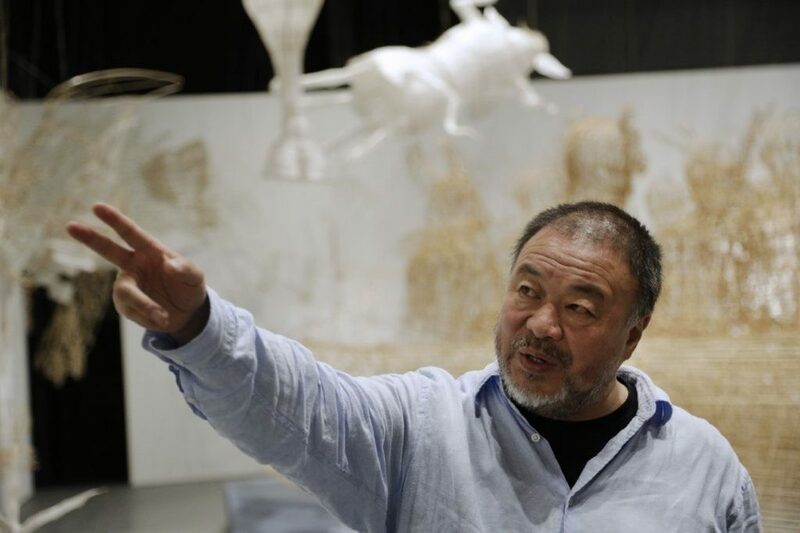 His themes of freedom of expression and refugees have new resonance now with the recent demolition of his Beijing studio. Simply having concurrent shows itself is a nod to multiplicity, a theme in so much of Ai’s work. The Marciano Art Foundation is showing the artist’s iconic “Sunflower Seeds” (2010), which consists of nearly 50 million individually sculpted porcelain sunflower seeds created by about 1,600 artisans, over two years, in the Chinese city of Jingdezhen known for porcelain-making. It addresses China’s vast population as well as economic and cultural exchanges with the West. His 2015 work “Spouts” – shown at the Marciano in its entirety for the first time – contains more than 250,000 antique teapot spouts from China’s Song dynasty. The veritable carpet of broken porcelain teapot mouths — many tilted upward as if gasping for air — is a call for freedom of speech among the masses. Just before leaving the Marciano Art Foundation, Ai — who was a child refugee in China, now lives in exile in Berlin and spends about half the year traveling for work — pauses on the gallery floor. His bamboo and silk art objects, delicate in material but heavy with meaning, hover and spin above him. Shadows flicker around him. Kites may be the perfect metaphor for displacement, he says.